Law firm pricing professionals have a new directory and it carries with it an accreditation that a group of industry veterans hope will “professionalize” the relatively nascent role of bringing pricing legal matters. 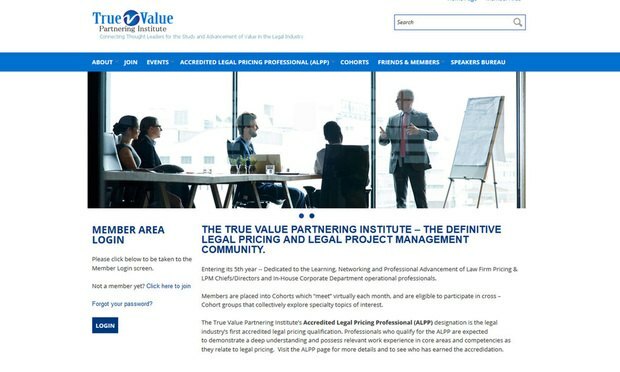 The True Value Pricing Institute currently lists about 45 pricing pros on its site as having obtained ALPP, an accreditation acronym for Accredited Legal Pricing Professional. The accreditation is meant to be difficult to achieve, and, unlike some accreditations, the ALPP can be taken away. To hold the designation, candidates must be employed as a pricing professional and spend 60 percent of their time dedicated to legal pricing. Those professionals must have at least three years’ experience at a manager level or one year of experience as a “chief” or “director” of pricing. Then there’s the curriculum. The accreditation requires 32 “educational credits,” which are not provided by the True Value Pricing Institute, but rather endorsed by it. Those credits can include reading texts on pricing; speaking at industry events; or participating in a group study-style course through the institute. The current list of “ALPP-ers” is dominated by employees of the world’s largest firms, including Baker McKenzie, DLA Piper, Morgan, Lewis & Bockius and Ropes & Gray. But it also includes professionals from smaller or regional firms, such as Nashville-based Bass Berry & Sims; Dallas-founded trial firm McKool Smith; and the Carolinas’ Nexsen Pruet. An Accreditation Seeks to ‘Professionalize’ Law Firm Pricing Directors | The American Lawyer.